Water Journey by Vortex Aquatic Structures, which provides landscape architects and designers new opportunities to create multi-generational inclusive play and relaxation areas, has been recognized with a GRANDS PRIX DU DESIGN Award. MONTREAL, QC--(Marketwired - May 19, 2015) - Vortex Aquatic Structures International (www.vortex-intl.com), a manufacturer and leader in aquatic play landscapes and entertainment solutions, is pleased to announce that its Water Journey™ aquatic play solution has been recognized with a GRANDS PRIX DU DESIGN Award at the 8th annual gala. Design firms, Dikini and Daily Tous les Jours developed the product, which is marketed by Vortex. 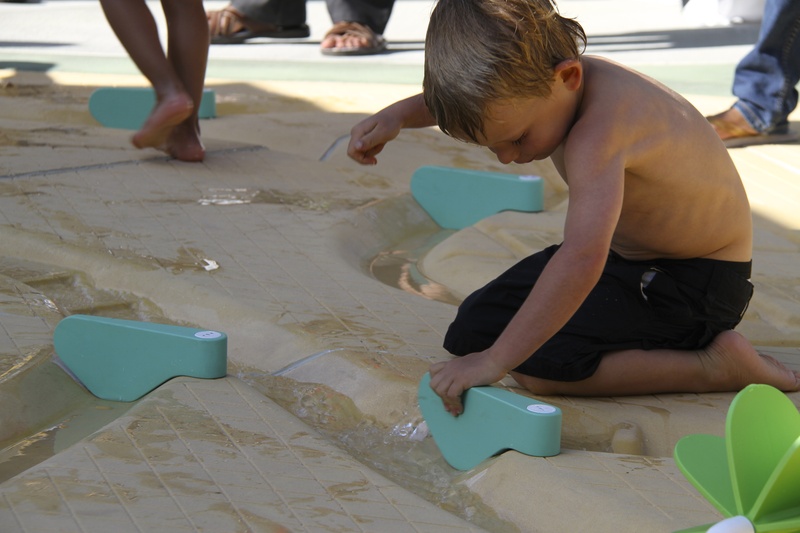 Manufactured and distributed by Vortex, Water Journey™ provides landscape architects and designers new opportunities to create multi-generational inclusive play and relaxation areas. Created to imitate nature's water systems, Water Journey's interlocking sets offer both an interactive experience for children and a communal meeting place for parents as they gather to watch water on its journey downstream. Divided into four events -- Labyrinth, Jet Dance, The Race, and Tide Pool -- Water Journey's features are designed to stimulate children of all ages physically, intellectually, emotionally and socially to learn by doing and playing. Maneuverable levers, water gates and pumps create an exciting chain reaction of water effects to capture the imagination, encourage teamwork and teach the relationship between cause and effect. Flexible in configuration, Water Journey™ is available as a single event or as a set of events to fit any specific space and design. Recognized by the jury for its high-quality design and attention to aesthetic detail, Water Journey's award for Best Street Furniture is among many exciting projects showcasing the talent of Quebec designers and architects in the fields of commercial, institutional and contract projects and product design. GRANDS PRIX DU DESIGN winners and their projects are celebrated at the annual gala, and featured in a special edition of INTÉRIEURS magazine. "We are always searching for new ideas to develop unique solutions that encourage the imagination of our clients and users," said Vortex President and CEO, Stephen Hamelin. "It is an honor that Water Journey™ won and we will continue to innovate and push the boundaries when it comes to aquatic play experiences." Find out more about Water Journey™ here. Find out more about GRANDS PRIX DU DESIGN here. Vortex Aquatic Structures international, headquartered in Montreal, Canada, was founded in 1995 with the introduction of the first Splashpad®. Vortex's use of the highest quality materials coupled with unique, inspiring design and state-of-the-art engineering, positioned the company as the world leader in aquatic play solutions. In addition to its operations in Montreal, Vortex has regional sales and technical support offices in California, Michigan and Texas in the USA, Lyon and Paris in France, Valencia in Spain, and Shanghai and Beijing in China. The company has a global marketing and distribution network supporting Europe, Asia, the Middle East, Australia, and Latin America. With over 6,000 installations worldwide, Vortex's mission is to lead the aquatic play industry by continuing to develop the most fun, innovative and safe products for families and children of all ages and abilities. For more information on Vortex Splashpad®, Poolplay™, Spraypoint™, Water Journey™ and Watermark solutions, please visit the company's website at www.vortex-intl.com.